Gallery of emotions for image of female face. If cosmetic make-up corresponds to emotional image of a female face then even sad emotions can look beautiful. Joyful eyebrows seem calm as eyes and mouth express quiet emotions. Quiet eyes and mouth seem glad as eyebrows express joyful emotions. The person realizes something happy and invisible, but this fine mental beauty is not expressed in feelings. Ideas are happy but feelings are covert, and absence of desires does not break peace of sensations. 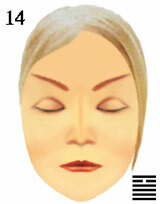 cosmetic image of a beautiful female face.